Although a cow may easily live 20 or more years, on modern farms few reach more than 4 years of age. They have their young stolen from them, they are milked continually with, live in cramped conditions and in the end are slaughtered and ground up into hamburger. I became Vegan in 1997 because I was horrified by the treatment of animals on farms and in laboratories around the world. I had grown up vegetarian and had felt content that I was doing what was necessary to help eliminate needless suffering, but when I learned, in particular, that mother dairy cows have their newborn babies stolen from them just days after giving birth so that the farmers can take her milk, I was sickened and outraged. The thought of stealing someone's baby so that I could have milk with my morning cereal was not only disturbing but also completely disgusting. I would later learn that mother dairy cows routinely will scream for their babies upon being separated, as would any good mother. For the newborn calf, sometimes only one day old, being taken from their mother is a visibly traumatizing experience. This process of taking the calf from the mother is not a new phenomenon of modern factory farming as many people like to believe. In order for farmers to get any sort of quantity of milk from animals, such as cows and goats, the young must be taken away from their mothers. To me, there is no ethical dairy short of human breast milk. If the newborn calf is male, he will more than likely be sold to a veal farm, where he will be placed into a wooden box not much larger than himself. His neck will be tied to restrict movement and he will be deprived of sunlight and iron, so that when he is slaughtered several months later his flesh is pale and soft. Many people are aware of the horrors of veal but most do not realize that veal only exist because of the dairy industry. Holsteins (a common dairy cow) have been bred for milk production and therefore do not gain weight in the way that beef cattle do, and from the perspective of profit hungry farmers, this makes the male animals virtually worthless since they, of course, do not produce milk. 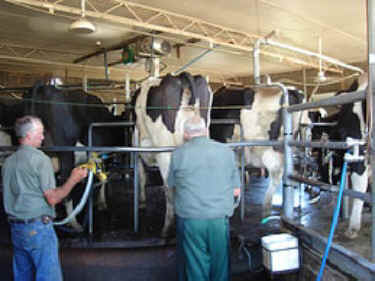 For the female dairy cow, her short life is one of artificial insemination, pregnancy, kidnapping, and milking. Dairy cows are kept almost continually pregnant so that their milk production remains high and to rapidly replace the numbers of animals killed when their production begins to drop. Knowing that this continues everyday, and this is just one of the countless horrors committed by animal abusing industries, is unbearable to me. I struggle immensely with the pain and frustration I feel at the inadequacy of a simply vegan lifestyle. Even with full time activism I still am not relieved of these feelings. But as hopeless as it can look I have not and will not ever give up. If you are about the treatment of animals, one of the most profound things you can do to help them is to adopt a vegan lifestyle today.